I have long-admired the pianist Mitsuko Uchida and frequently turn to her recordings of both the Mozart piano sonatas and concertos. Likewise I have been a fan of Simon Rattle ever since I saw first saw him conduct at Birmingham Town Hall so I approached this latest release from Berliner Philharmoniker Recordings with a sense of keen anticipation. However, as Mitsuko Uchida’s earlier ‘cycle’ of the Beethoven concertos with Kurt Sanderling and the Bavarian Radio Orchestra and the Royal Concertgebouw Orchestra attests, putting top class performers together is no guarantee of success. I never doubted that Uchida had the technique, tone and sensititivity to perform these great works to the highest level. Likewise Kurt Sanderling has the experience to bring out the best of two very good orchestras but somehow, for me at least, the marriage was far from satisfactory. Together they failed to capture the wit of the first, the simple elegance of the second, the drama of the third, the serenity within my personal favourite the fourth or the great majesty of the ‘Emperor’. That is not to say the performances could not be enjoyed; they are in excellent sound and are well enough played but that special something that brings out the eternal in Beethoven just isn’t quite there. However I have no such qualms about this latest release. In these live recordings, each of the concertos is to be preferred to her earlier release and can stand comparison with the best. Uchida used her own sonorous Steinway grand for these performances and the Berlin engineers have captured both the inner subtlety and the vivacity of her playing. The Berliner Philharmoniker perform on modern instruments but Rattle’s interpretations have a clearly historically informed style. 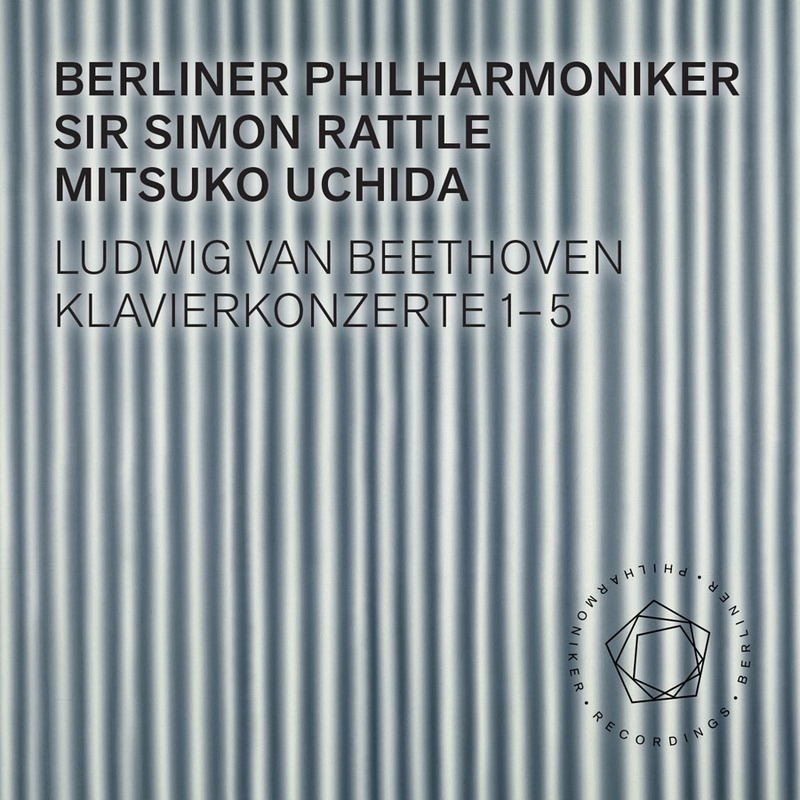 The fourth and fifth concertos are taken at slower speeds than I am used to but Uchida brings this off – in lesser hands it might well not have been so effective. There is such a sense of soloist, orchestra and conductor being in total empathy with one another it is hard to believe that this concert series was the first time they had performed together. The modern listener is so spoilt for choice when it comes to recordings of these works that any newcomer needs something special to be of note and this certainly falls into that category. This was reviewed as a high resolution download direct from Berliner Philharmoniker Recordings with a digital booklet. It is also available, at significantly greater cost, as a luxury coffee table package containing 3 CDs + Blu-ray Audio + Blu-ray Video with hardcover book and a download code.